In the UK, for far too long the talk has been of curbing immigration. We seem to think that all our ills come from those pesky incomers: they're taking 'our' jobs, using 'our' services, ruining 'our' lives – except, of course, that most of the time they aren't. They are, in fact, often doing the jobs we don't want to do for less money than we'd accept. And they're also paying their taxes and improving our lives. At considerable personal cost, they hope they are improving theirs too. Some of them are Portuguese. Rightly or wrongly we know how we feel about immigration but how often do we ask ourselves how they feel? To get just a glimmer of an insight into the Portuguese view, click here. On our way to Ikea – all right, I suppose we should always support indigenous Portuguese companies but doesn't everyone shop at Ikea sooner or later? 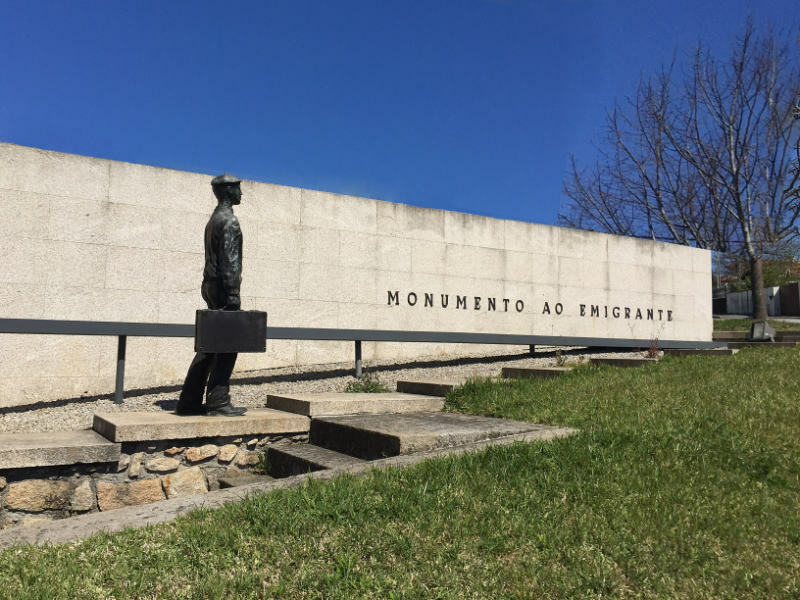 – we pass this monument at a roundabout in Lage, just outside Braga. I am always struck by the pathos of this lonely figure: the Portuguese emigrant choosing a path at a crossroads in his life. For the same reasons as Ireland and Scotland – poverty, lack of economic resources, unproductive terrain - Portugal has for centuries been an exporter of people whether to the old colonies or to the European Union. There he stands captured in bronze, a young man, probably in his early twenties. Perhaps he's not long married and is wondering how to support his wife and a new born baby in a region where there isn't much work and what work there is pays badly. What is a responsible man in his situation to do? British people will know the answer, given to us by the politician, Norman Tebbit. He told us that his out-of-work father 'got on his bike' and went to look for work. So, take a look at this young man in his knitted pullover, shapeless, baggy trousers, worn working boots and beret. He's a man who is metaphorically 'getting on his bike' and doing the right thing: he's looking for work. Carrying a small cheap suitcase with a very few belongings, he's all alone, setting off for an uncertain future in a strange country, probably one where people speak a language he doesn't know, unsure of whether or not he'll find paid employment. How does that brave young man feel about the adventure he is embarking upon? It's hard to say. His face is expressionless. Maybe if he let himself think, he'd weep. After all, most of us have a visceral attachment to the land of our birth, its people, its language and its customs. I'd lay a bet that this man with the set face is no different. He doesn't want to leave behind the family, friends, food, .... that he knows and loves and yet he is going away all the same. He looks stoic. No doubt he experiences hope, fear and expectation but he seems to be suppressing them. It's a truism, of course, but I think we often forget that every immigrant is also an emigrant and that the pain and frustration is not all on one side. We resent the incomer with different ideas, to our mind peculiar habits, and a very different way of expressing him or herself - though it's mostly himself – meaning that we can't understand them properly. We, however, have the comfort and support of the majority around us. 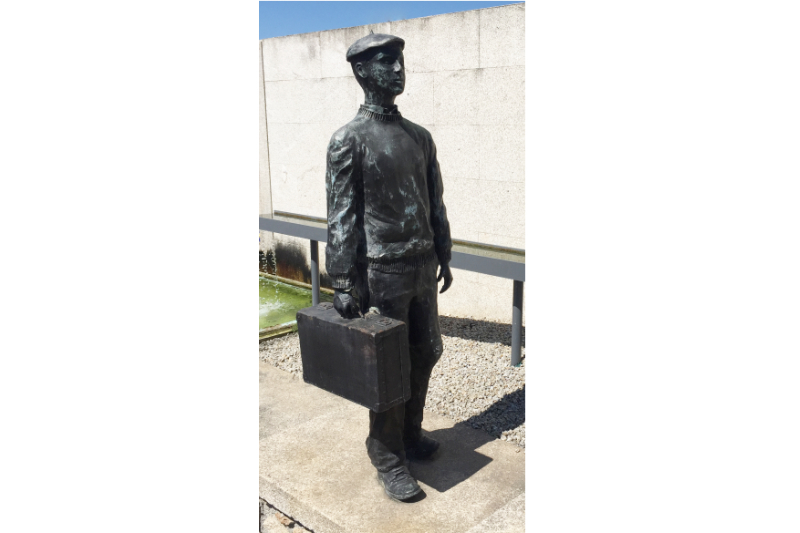 The immigrant/emigrant is often alone and friendless just as we see in the bronze statue dedicated to him and his solitary journey at the roundabout in Lage. I find this simple monument touching. How about you? Hi Margaret...you've picked two subjects that have both, at some time or another, touched me. Glad you like the posts. In fact it's not only Alberto who is so pleasant to deal with. I think his son, Nuno, and daughter-in-law, Manuela are lovely people too. You can see it in all their faces. As to the emigrant, in other circumstances that could be you or me, couldn't it? Thanks for the comment. Keep on reading..